Army Sergeant Erin Crawford enlisted in the military in February of 2004 out of a sense of duty for her country and with a desire to better the life for her family. She served three tours in Iraq over six years before being honorably discharged in August of 2010. 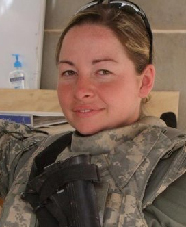 Throughout her service, Sergeant Crawford’s unit was involved in constant IED, small arms, and ambush attacks, and she suffered numerous injuries during her three tours in Iraq. Among her injuries are severe chronic posttraumatic stress disorder (PTSD), mild traumatic brain injury (TBI), sleep apnea chronic back pain, and a left knee injury. She also had torn her ACL during Basic Combat Training, although it was not diagnosed until later. She tore it again during her second deployment in Iraq. Among the commendations awarded to Sergeant Crawford are the Iraq Campaign Medal with three campaign stars, Army Commendation Medal (2x), Army Achievement Medal (2x), Army Good Conduct Medal (2x), National Defense Service Medal, Global War on Terrorism Expeditionary Medal, Global War On Terrorism Service Medal, Commissioned Officer Professional Development Ribbon, Army Service Ribbon, Overseas Service Ribbon (3x) and the Combat Action Badge. Sergeant Crawford, her husband Robert, along with their children, will receive a mortgage-free home in Range, Alabama in 2016.